Corporate-fascist feel-good scam seeks to crush competition & establish global monopoly with army of NGOs. February 16, 2012 - Called "Revenue Watch" it claims to be "a non-profit policy institute and grantmaking organization that promotes the effective, transparent and accountable management of oil, gas and mineral resources for the public good. Through capacity building, technical assistance, research and advocacy, we help countries realize the development benefits of their natural resource wealth." In reality, it is a Wall Street-London centric front of monolithic proportions that ensures foreign competitors, including nationalized companies, are prevented from exploiting in many cases their own national resources, so that they may be reserved instead for the West's corporate giants to plunder them. In many cases, this includes funding and organizing opposition groups to take to the streets and physically stop ongoing projects under humanitarian and environmental pretenses. Video: Thomas Barnett building an army of "system administrators" (aka civil society) to expand into "peace spaces" while US global military conquers "battle spaces." Soros' Revenue Watch along with the National Endowment for Democracy have created just such an army of NGOs. And just as soldiers witlessly promote imperialism believing they are fighting for "freedom," these NGOs expand Wall Street and London's global hegemony, believing they are promoting "human rights." A look at Revenue Watch's "partners" page reveals what at only a superficial glance appears to be well-intentioned, noble civil endeavors. However, upon closer examination, a different story is told. Who's Partnered With Soros' Revenue Watch? What the "partners" page represents is an interconnected, incestuous network leading each time back to George Soros' Open Society Network, the OCED, USAID, British DIFD, Australia Aid, and the UN Development Program, all of which are directly partnered with the largest banking, big oil, defense contractors, and consumer multinationals on earth. The very first "partner" on Revenue Watch's list, Democratic Republic of Congo's Action Contre l’Impunité pour les Droits Humains (ACIDH), is entirely funded by George Soros' Open Society, OCED Watch, and the European Commission. Other organizations listed, such as "RAID" and Cee Bank Watch Network (itself a Revenue Watch partner), are in turn Soros, Ford Foundation, Sigrid Rausing Trust, Freedom House, Heinrich Boell Foundation, and European Commission-funded fronts. The African Centre For Media Excellence fails to list who in fact funds them, but they do report that their "Reporting on Oil, Gas and Minerals" training courses are conducted in partnership with Penplusbytes (listed as OSIWA & OSISA respectively and a Revenue Watch partner itself) and Thomson Reuters Foundation (page 42) both of which are Soros-funded, while the latter is also funded by US State Department-funded BBC World Service. One can only wonder why corporate-financier interests would be involved in "training" locals on how to report about their own natural resources, to prevent exploitation, or help facilitate it? Other partners include the Canadian and Australian government-funded Parliamentary Centre and the Soros-funded "Publish What You Pay," which polices governments of resource-rich nations on how much money they receive from multinational corporations and how they spend it. Middle East & Asia: The British DFID, UNDP, Soros-funded TIRI, and World Bank-funded, Integrity Watch Afghanistan. 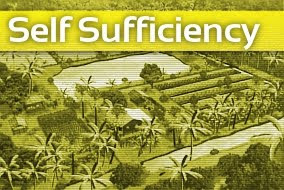 The resource management-oriented Indonesian-based Institute for Essential Services Reform, created by USAID, the Asian Development Bank and Germany's KfW "development bank." The Iraqi Institute for Economic Reform (IIER) whose board of trustees includes Dr. Kamal Al-Basri formally of General Electric Capital, Barclays, and Lloyds Bank and Mustafa Al-Shawi a professor of Salford University, UK and a consultant for UN and World Bank projects, and who under a category titled "other activities" claims to be "doing business with World Bank." The IIER also claims to have "good working relationships with several international ogranizations and NGOs including CIPE, IRI, USIP, and CATO Institute." Of course CIPE is funded by the US State Department, the National Endowment for Democracy (NED), which also funds the IRI (International Republican Institute), and USAID. The USIP (US Institute of Peace) is also a creation of the US government. In other words - the IIER is seeking "economic reform" according to Wall Street and London's interests. Africa: The African Conservation Foundation funded by British Airways, defense contractor Esri, Microsoft, and the "Food and Agriculture Organization of the UN (FAO). The Soros, Ford Foundation, DFID, Australian Aid, USAID, World Bank, Tides, European Commission-funded Agency for Cooperation and Research in Development. The Ford Foundation, EU, US & British government-funded "Zimbabwe Environmental Law Association." While it is clear that despite the myriad of organizations listed within Revenue Watch's "partner" list, with pages of smiling brown children, giraffes, green meadows, and windmills, it all leads back to a handful of government and corporate-funded foundations, and this alone should warrant cautious scrutiny, a tangible impropriety can demonstratively be seen playing out where Soros and the cabal of corporate-financier elite he represents are fighting most desperately. Image: CIA's Otpor fist has made its way around the world from Serbia and across the "Arab Spring." It is now "punching" Chinese-Myanmar cooperative development, in particular the "Shwe Gas Project" with funding and support from NED, George Soros' Open Society, and the OCED. Amongst the myriad of organizations listed on Revenue Watch's partnership list, is the Shwe Gas Movement. There are no smiling brown people to be found here, instead the clenched fist of the CIA's Otpor movement can be seen "punching" Chinese-Myanmar oil rigs and pipelines, as well as mobs waving Wall Street-London creation Aung San Suu Kyi's National League for Democracy flags in the streets of London. Video: The Shwe Gas Movement protest takes to the streets of London, waving the flag of Wall Street-London creation, Aung San Suu Kyi and her National League for Democracy. 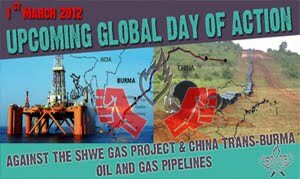 We see photo galleries where the "Shwe Gas Movement" seems to be attempting to raise international awareness of the "impact" of a pipeline being built from Myanmar's southern coast all the way to the north where it continues on into China. Aside from muddy construction sites. trucks transporting pipe segments, and equipment photographed with a temple in the distant background with the caption "religious area disturbed by project equipment" nothing seems to be taking place that is any more or less extraordinary than one would find surrounding any large scale infrastructure project. 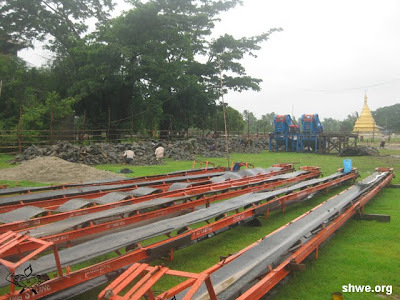 Image: Shwe Gas Movement's caption for this photograph reads, "Religious area disturbed by project [equipment]." One must wonder why the photographer picked this angle, when a closer view of the temple and how it was being "disturbed" would have been far more compelling. "To raise awareness, strengthen local net­works, and mobilize activists in resource extraction-affected areas of western Burma. The organization will train local field researchers in information documen­tation and community mobilization methods and raise awareness internationally and within the affected areas about the mili­tary’s natural resource extraction projects." We've already seen the US and British governments through an array of foreign-funded NGOs succeed in shutting down, at least temporarily, the Myitsone Dam. The dam, in addition to raising revenue for Myanmar by selling electricity to China, would have provided a percentage of electricity for Myanmar, along with flood control, river navigation, and irrigation for the surrounding region and eventually would end up under full ownership of the Myanmar government after fulfilling a 50 year contract with China who was financing and building it. Of course, Soros and NED funding projects to shut down the cooperative development of Myanmar with its immediate neighbor to the north, China, alone indicates corporate-financier interests at play. NED's entire board of directors is represented by certified warmongers, Neo-Conservatives who have signed their name to the Hitlerian "Project for a New American Century," declaring their intentions to establish a 100 year reign of American global hegemony, and a mixture of corporate lobbyists and consultants. It is highly unlikely they stopped the Myitsone Dam or are attempting to stop the Shwe gas project to preserve Myanmar's pristine environment and to savor the smiles on the brown faces their corporations and war machine have been devouring since Marine Corps General Smedley Butler wrote "War is a Racket." Indeed, at the highest levels funding Revenue Watch's activities and the myriad of organizations it is partnered with is the Organisation for Economic Co-operation and Development (OECD). 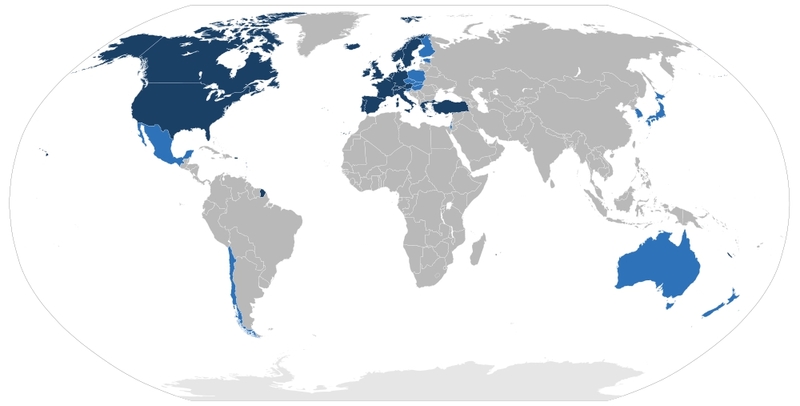 Image: OCED nations - also looking suspiciously like Wall Street and London's sphere of influence and NATO's membership. The OECD was born of the various "international institutions" created by the victors of World War II to rebuild the shattered world in the shape of their choosing. It was the precursor of the European Union and it still exists actively funding the destruction and criminal consolidation of sovereign nation-states today. Composed of an Anglo-American axis including the European Union, it is involved in the UN and the various "aid" organizations of respective member countries, USAID, DFID, and Austrian Aid for example. "BIAC has contributed much over the past fifty years towards the OECD’s work promoting open and competitive markets, level playing fields and sound regulation and governance; fighting against protectionism; and enabling businesses to compete and succeed in an increasingly complex global marketplace." Clearly OCED's association with Revenue Watch is much like a thief with a crowbar - that is to use the organization to pry off the locks of protectionism and national sovereignty. Revenue Watch is creating the "level playing fields" and "fighting against protectionism" in nations that would otherwise develop their indigenous resources without giving OECD's member nations an opportunity to profit in markets that surely would not be considered "open and competitive" from their globalist points of view. Of course, the wealth of OCED's member nations was built not only on protectionism, but in many cases centuries of extraterritorial exploitation, military conquest, and sweeping global empires. OCED through its OCED Watch organization counts the above mentioned Shwe Gas Movement as a member. Open Society is also counted as a US member, along with "International Rivers" who helped participate in the shutting down of the above mentioned Myitsone Dam. UK members include Amnesty International and the above mentioned RAIDS. As a Zimbabwe member, the above mentioned Zimbabwe Environmental Law Association is listed. Another Revenue Watch member, the Democratic Republic of the Congo's "Action Against Impunity for Human Rights" is listed on the OCED Watch site as a member. And the list goes on. OCED's BIAC lists as its member organizations the various chambers of commerce in each member nation. This includes the Australian Chamber of Commerce, the Canadian Chamber of Commerce, the Confederation of British Industries, and the United States Council for International Business (USCIB). These collectively are the largest corporate-financier interests on earth and many of the multinational corporations listed also constitute the boards of directors, trustees, and sponsors of the most influential think-tanks on earth. These are the very think-tanks that engineered the wars in Afghanistan, Iraq, and Libya, and have laid plans to topple Syria and enact regime change in Iran. 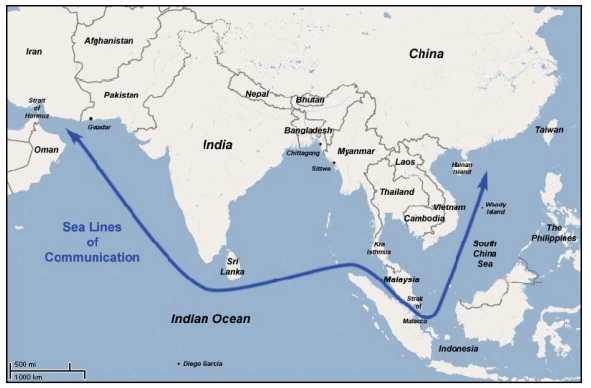 They are also the think-tanks that have articulated an agenda of realigning ASEAN against China to encircle and contain the rising superpower, militarily and economically. When we see Wall Street's George Soros in tandem with the UN and OCED funding NGOs trying to stop Chinese-Myanmar pipelines and dams that benefits both nations, it is clearly being done as part of implementing these documented plans to balk China's rise and prevent the development of nations in the region. It is not that Soros and the OCED want to preserve Myanmar's resources for the people of Myanmar, it is that they want those resources, the wealth and power they represent for themselves while denying any nation the ability to rise and possibly compete with the Wall Street London international order. Image: From SSI's 2006 "String of Pearls" report detailing a strategy of containment for China. The blue arrow represents China's logistical life-line and the nation's it passes. It also represents the target of Wall Street and London regime change efforts, destabilization, and meddling NGOs seeking to cut it. With OCED's BIAC corporate-sponsors including DuPont, ExxonMobil, GlaxoSmithKline, Nestle, Shell, Unilever and others, behind the same think-tanks that destabilized and carried out an armed proxy NATO invasion of Libya, ousting Chinese and Russian interests and rushing in with Western contracts, it is clear what they intend to do in other regions of the world where they direct their feigned humanitarian concerns. In Libya, we even saw the installation of a Petroleum Institute chairman, Abdurrahim el-Keib, as "prime minster." In Uganda, British firms under the cover of fake environmentalism had 20,000 people forcibly evicted from their property to "plant trees" and cash in on the carbon trading pyramid scheme. Indeed, Revenue Watch is nothing more than a feel-good fraud drawing in countless well-intentioned people from around the world, some of them risking their lives for what is essentially the construction of a 21st century corporate-financier ruled global empire. It is an empire where everyone will lose except those at the very top. And despite Soros' assurances that he is a left-wing liberal and the endless slide shows of smiling Africans playing on his websites, he is indeed amongst one of the most vicious, persistent corporate-fascist facilitators alive. While the scale of Revenue Watch and the Soros-OCED-corporate-fascist nexus driving it seems monolithic and indomitable, tracing back to the source of their power we find individual consumers like you and me. By identifying the corporate-financier interests driving this, listed conveniently by the USCIB on their membership directory and in the annual reports of think-tanks across the Western world, we can then begin boycotting and replacing them with local solutions. While it may seem like doing something as small as not buying Coke or Pepsi is an act of futility, it is exactly everyone buying one or two products a day from these giant, global spanning multinationals that have granted them this unwarranted influence in the first place. In a world where so much is out of our reach and beyond our control, reading this article, being outraged, and immediately doing something about is most certainly not.